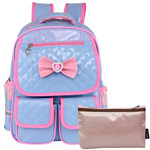 kilofly Girls PU Leather School Backpack is a nice durable school bag that is suitable for girls over 5 years old. Made of high quality PU material, this cute backpack is very durable and can be used for years. This backpack has 3 front exterior pockets, 2 side pockets and 1 laptop sleeve that fits books, an iPad or a 15" (38 cm) laptop inside. With its cute color and a lovely bow in front, this bag definitely will become your girl's favorite bag. Definitely a nice school bag for your darling princess!